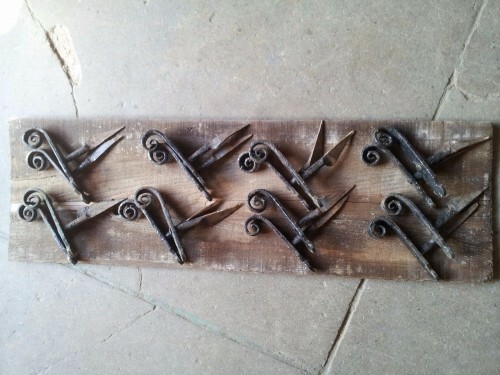 Four (4) pairs of vintage (used) wrought iron shutter dogs available for $30 per pair; or a set of all 4 pairs for just $100! NOTE: Photo shows eight (8) pairs; we only have four (4) pairs left. Dimensions - Each shutter dog is approximately 6-7 inches long x 6 inches deep x 1 inch wide (they all vary). Each shutter dog is different. We have selected these to match (in pairs and as a full set) as closely as possible. That said, they are all individual and show wear appropriate with their age, minor rusting. All of our items are sold in used "as-is" condition. We will be happy to answer any questions you may have 215-843-3074. Philadelphia Salvage Co.